The 2013 Pinot Noir has a clear, light and fresh berry nose with subtle sous bois scents developing in the glass. The palate is fresh on the entry with supple, fleshy tannin, plenty of red berry fruit and a sense of reserve on the finish that suits it well. This is thoughtfully crafted. Exciting things are in store for this vintage. I can honestly say I’m in love with the 2013 Estate as it delivers a brilliant balance of red fruit and exotic spice to your palate. I challenge the Carlton Hill faithful to try not to drink an entire bottle in one sitting. But, trust me, it wasn’t easy to get his great wine into bottle. Sometimes it is good to be paranoid. The 2013 vintage was like falling into a deep slumber in the tall grass of summer until the typhoon hit! That’s right, just at harvest time, Oregon was greeted with the remains of a fierce typhoon offered up by the Japanese currents that usually temper our climate. Four straight days of hard rain and high winds. To be honest, it was the last vintage I had a full head of hair. But, I regress. Because I am suspicious of Oregon weather in general, I actually dropped fruit fairly aggressively during the mid to late summer. Some of my peers, given the beautiful weather provided in June, July and August, felt this strategy was a mistake. Fruit set had been quite generous, so I believed this made some sense to begin with. In retrospect, giving the clusters plenty of breathing space paid off. 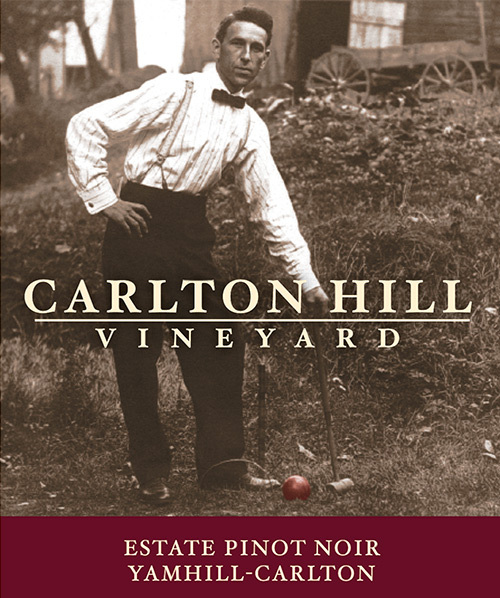 In a year which featured high levels of butch rot or botrytis, the Carlton Hill Vineyard was virtually disease free. Hedging my bets and watching the weather forecasts, I did pick about 40% of my crop the day before the bombs let loose. Ten days later, after some drying and active canopy management, the remainder of the crop was taken with brix ranging between 23 and 24.5 in fermenter. As for the wine, we stayed true to our philosophy of producing vintage driven Pinot Noirs. Consequently no chaptalization, concentrating or reverse osmosis was performed in the winery. And, given the high quality of the fruit at harvest, we were comfortable in using the whole cluster fermentation process. Nearly 40% of the juice comprising the 2013 Estate Pinot Noir derives from whole cluster fermenters. As is the case for all of the Carlton Hill Estate vintages, this wine was aged in wood for 12 months, 20% of which was new French oak. At bottling, the PH on this vintage was at a nearly ideal level of 3.60. This acidity level, when combined with the wonderful phenolics this vineyard supplies us year after year, produces a wine characterized by fresh red fruit (raspberry, cherry and red currant come to mind) supple tannin, and generous length throughout the pallet. On the nose, hints of rose and violet intertwine with clove and earthy fragrances. Two years in bottle, the 2013 Estate is just beginning to hit its stride. Enjoy!